What’s black and white and black and white and black and white? This is another two for one post, because I’ve made and blogged both patterns before. 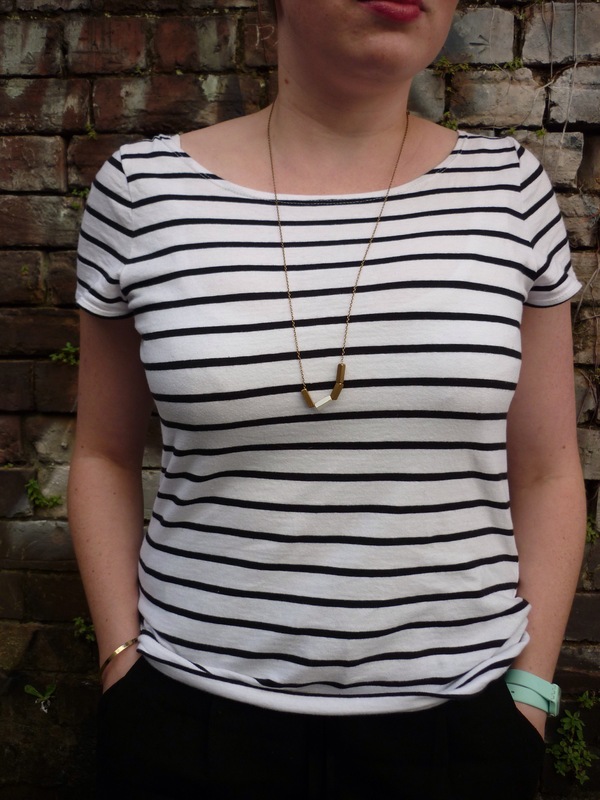 The top is (of course) another Grainline Studio Lark tee, this time with cap sleeves and a boat neck. I used some 100% cotton that I picked up at Drapers Fabrics in Auckland when I was up there at the end of last year, and it is so soft and lovely! Being pure cotton it is starting to pill a little bit on one hip, where my bag rubs against it, which is a shame. I have enough fabric to make another one though, so if this one gets too shabby looking I’ll just replace it. 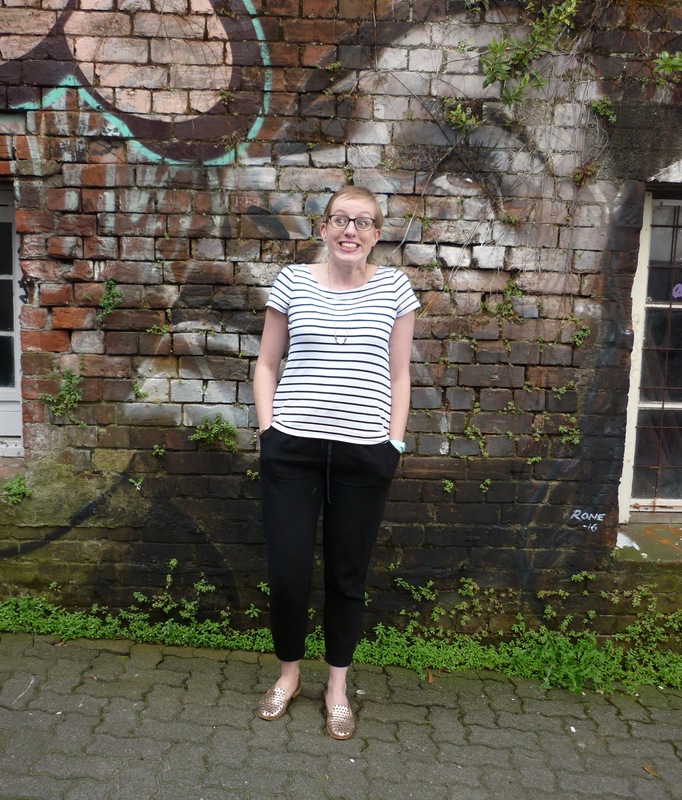 Can’t just give up on my perfect striped tee! I took about 2″ off the length off this tee, at the lengthen/shorten line, and then took a deep hem, so I think its probably been shortened by at least 3″. I love the length it is now, just right for wearing untucked. The only thing I would change for next time would be to consider making a facing for the neckline. Turning and stitching would probably be fine for fabric with good recovery, but the 100% cotton does get a bit saggy with wear. I think a facing with some light knit interfacing would help it to hold its lovely shape. So, onto the trousers! 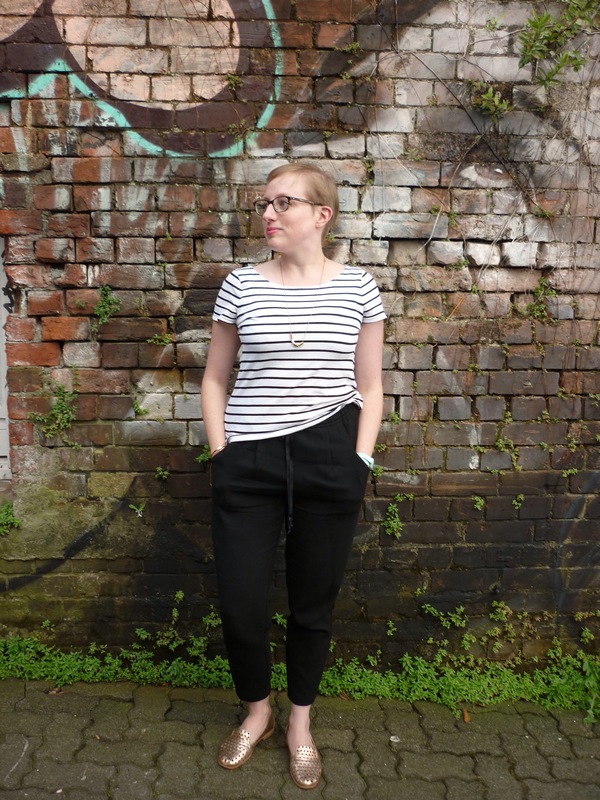 These are the Named Alexandria Peg Trousers, made up in a lovely wool crepe from The Fabric Store. 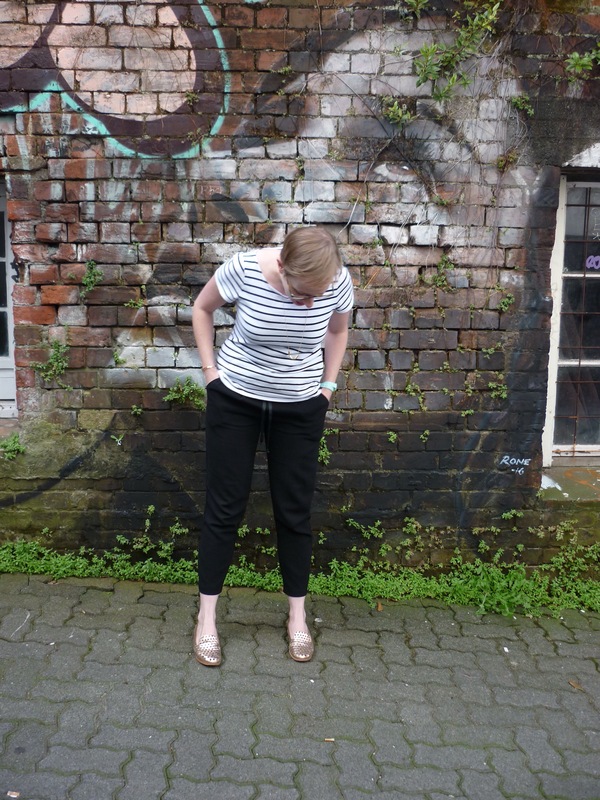 I really wanted a ‘winter weight’ pair of these trousers, but realistically there are more spring/autumn weight and the Wellington wind cuts straight through the crepe! We’ve had some lovely fine weather here this autumn though, so they’ve been getting some decent wear. I made them exactly the same as my rayon pair, except this time I used two gold eyelets at the centre front and ran some black grosgrain ribbon through the waistband. I didn’t pick very good elastic to use, it is very soft and I had a terrible time trying to keep it flat inside the waistband as I was topstitching it! I made the pocket bags out of some scraps of black linen to help stabilise the stretchier crepe at the front pockets, and it seems to have worked really well, they aren’t bagging out or anything. I added the patch pockets on the back too, as they actually show up on this plain fabric! I loved sewing with the wool crepe, its so lovely and malleable. It is a tiny bit rough, but nothing major. The biggest downside to these pants is how much fluff sticks to them! Cat fur, thread, lint…its like wool crepe is a fluff magnet. I might have to buy shares in whichever company makes those sticky lint rollers. 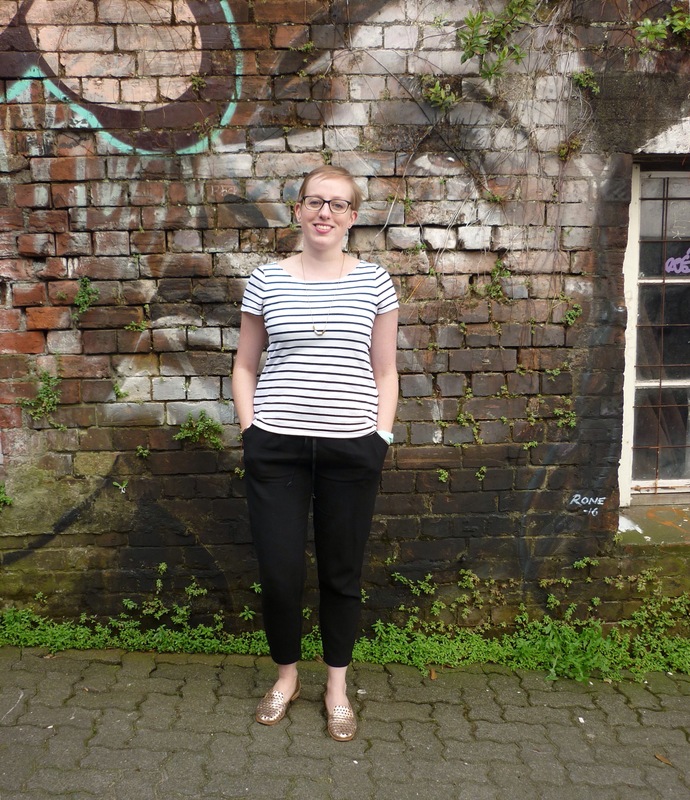 I got my little sister to take these photos after we had been out for lunch with Mum, its so nice to get some pictures away from my teal wall! She’s a very good photographer, but I still managed to be pulling terrible faces in about 75% of the photos. Then there are some gems like the one above… I do like this little side alleyway though, with pretty street art and trees growing out of the bricks. I really like this outfit too! Just goofy grins all round, really. Thanks! I did consider something like that, but I wasn’t sure how the elastic would curve around the ‘corners’ of the neckline. Might be worth experimenting with though! This is a very chic outfit lady. I’m all for a facing on a boat neck neckline. You’re right – it does stabilise it and I think gives a really nice rtw finish. I’m tempted by the pants pattern. I’ve had 3 not particularly successful woven pants now from 3 different patterns….. Thanks Sarah! I really like this pants pattern, I’ve got some more fabric for a pair for next summer already! I love your outfit! Made me google for wool crepe, but that’s nothing to find here (at least not if it should be afordable 😉 ) And I think there can’t be too much vblack and white, it’s classy. Thanks Frederike! I’m sure Fabric.com would have wool crepe, but I don’t know how much shipping to the EU would be. 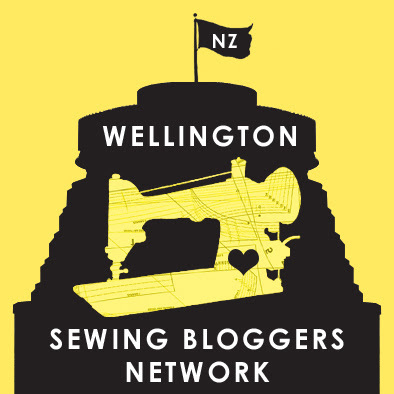 Probably as much as it is to NZ 😬 I thought my old blog design was too busy, I’m hoping this one isn’t too minimal! Stripes and boat necks are the best combo! Love this whole ensemble & the photos. 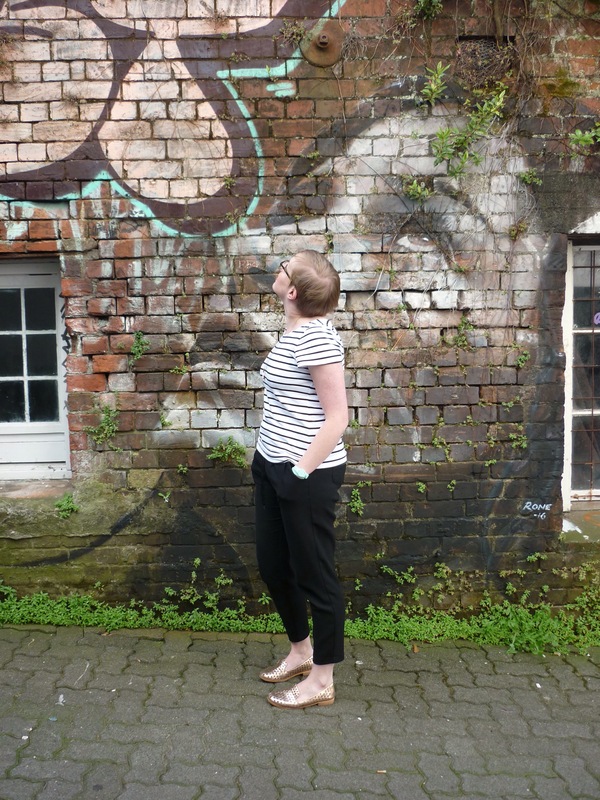 I also pull a wide variety of faces (& close my eyes in about 85% of) blog photos! I love this outfit!! You can’t have enough stripey shirts, in my opinion. Also black and white is so classic! I LOVE your gold shoes!